El Camino de Santiago, in English “The Way of Saint James,” refers to the pilgrimage route to the Cathedral of Santiago de Compostela in north-western Spain, where legend has it that the remains of Jesus’s apostle Saint James the Elder lie. Today, “El Camino” continues to direct travellers and pilgrims to the remains of the fiery-tempered Apostle, whom Jesus once called a “Son of Thunder”. Whilst the Camino has existed as a Christian pilgrimage for well over 1,000 years, there is evidence of a pre-Christian route as well. The Iberian Peninsula had already experienced a period of brisk comings and goings. One after another, Greeks, Carthaginians and Romans settled in a region that was already inhabited by people of Iberian and Celtic descents, long before the rediscovery of the Apostle’s tomb and his relics in 814. Throughout the medieval period it was one of the three most important Christian pilgrimages undertaken. Indeed, it was only these pilgrimages—to Jerusalem, Rome, or Santiago de Compostela that could result in a plenary indulgence, which frees a person from the penance due for sins. Christian legend has it that when the Apostles divided the known world into missionary zones, the Iberian Peninsula fell to James. Seventh and 8th century documents suggest that he spent a number of years preaching there before returning to Jerusalem, where he was beheaded by Herod Agrippa 1st in 44 AD. After his martyrdom, the story goes that his followers carried his body to the coast before laying it in a stone boat. Guided by angels, the boat was carried by the wind beyond the Pillars of Hercules (the Strait of Gibraltar) to land near Finisterre, at Padrón, in northern Spain. From there his followers took the coffin 12 miles inland where they found a suitable place to inter it. They then asked the powerful local feudal ruler, queen Lupa, a pagan queen, for land to bury the body. The queen declined and accused them of committing the sin of arrogance and sent them to the court of King Duyos, an enemy of Christianity, who imprisoned the men. According to legend, an angel – or in other stories, a bright and starry light- freed the seven men from captivity and whilst fleeing, another miracle killed the soldiers pursuing them while crossing a bridge. After this miraculous escape, the disciples once again turned to the queen who as before, tried to dispose of them by sending them to mount Illicinus - today's Pico Sacro. There, so she told them, they would find a number of tame Oxen to pull a cart containing the Apostle’s corpse. However, Theodorus and Atanasius found themselves amongst wild bulls. After they had miraculously tamed and harnessed the bulls to the front of the cart, they returned to the palace of queen Lupa, where upon she was struck with such astonishment that she asked to be baptised and offered her palace for the entombment of St. James. Today, in its place stands the Cathedral of Santiago. The story of St. James in Spain then goes quiet until the first third of the 9th century, when Pelagius, a hermit living in that part of Galicia, had a vision in which he saw a star or a field of stars that led him to what proved to be an ancient tomb containing three bodies. He immediately reported this to the local bishop, Theodomir, who declared the remains to be those of James and two of his followers. Theodomir in turn reported the find to King Alphonso II, who declared James to be the patron saint of Spain, or of what would eventually be Spain. That would come later. A small village named Campus de Ia Stella (Field of Stars) and a monastery were established on the site. (Or possibly the Roman word for cemetery, "componere": to bury, is the source.) In any event, news of the discovery spread like wildfire and a trickle of pilgrims began to arrive. Miracles came to be attributed to the site, and the miracles encouraged pilgrimage and pilgrimage elicited more miracles. This was all greatly encouraged by the powerful Archbishop Gelmirez of Galicia and the cathedral authorities, who were anxious to promote Santiago as a pilgrimage destination, as well as by the monks of the Abbey of Cluny in France who were anxious to support the Spanish Church in its struggle against the Moors on the Peninsula. And thus began the millennium-long relationship between the spiritual holy and the commercial.The pilgrimage to the shrine became the most renowned medieval pilgrimage reaching its peak during the Middle Ages. It’s safe to say that it constituted a major cultural aspect of that period of history in Europe. The continuous growth in the number of pilgrims during the first centuries of the Camino, was accompanied by an equally continuous effort to enhance the infrastructure of the way of St. James - which in turn led to the establishment of a single route. Warnings were issued to avoid dangerous areas and safer ones were recommended. The daily needs of pilgrims on their way to, and from, Compostela were met by a series of hospitals and hospices. These had royal protection and were a lucrative source of revenue. Pilgrims were very well protected and attended along the way. El Camino de Santiago had many religious houses and refuges to assist the pilgrims and where it was put in practice the Christian ideal of hospitality. In those centres, pilgrims were assisted for free, both in the material and spiritual aspects. Firstly their feet were washed, after that they were provided with a hot meal and accommodation for the night; and finally the pilgrim was given food for the journey on the following day. If they died in any of these refuge centres, the pilgrims would receive Christian sepulture. However, sometimes they had to use the local inns and taverns where not only did they have to pay but they were often deceived. A new genre of ecclesiastical architecture, Romanesque, with its massive archways, was designed to cope with huge devout crowds. Bridges, refuges, hospitals and monasteries were built and even entire settlements were created along the course. Estella, Santo Domingo de la Calzada and Puente la Reina as well as countless small villages bearing the addition "del Camino" in their names give testimony of how royal privileges fostered these settlements. The pilgrimage route to Santiago de Compostela was possible because of the protection and freedom provided by the Kingdom of France, where the majority of pilgrims originated. Enterprising French people (including Gascons and other peoples not under the French crown) settled in towns along the pilgrimage routes, where their names appear in the archives. Pilgrims would walk the Way of St. James, often for months, in order to arrive at the great church in the main square of Compostela to pay homage to St. James. The 12th century saw the creation of the Book of St. James (first Camino guidebook) also known as the Liber Sancti Jacobi or Codex Calixtinus - after Pope Calixtus II who was originally thought to be its author. It was, however, written by a French monk called Aymeric Picaud, who compiled the five books of the Codex between 1130 and 1140. The fifth book spoke about the history of the Camino, and was written by Picaud himself. Four of the pilgrimage routes listed in the Codex originated in France and all converge at Puente la Reina. From there, a well–defined route crossed northern Spain, linking Burgos, Carrión de los Condes, Sahagún, León, Astorga, and Compostela. The Codex describes amongst other things, landscapes, churches and monuments as well as the manners and customs of the various regions' inhabitants a pilgrim would encounter. The book also described foods that could be found along each stage of the way. Picaud's description of the 13 sections of the Camino, which was to be completed over several days, aided the establishment of what we know today as the Camino Frances, or in Spanish, “el Camino de Santiago”. Between the 11th and 13th centuries, Christians from all over Europe came in their droves to Santiago de Compostela, with up to 1000 pilgrims daily visiting the Apostle’s tomb. After its peak during the Middle Ages, the phenomenon of pilgrimage to Santiago tapered off and several possible causes or contributing factors have been cited. At the end of the 16th century Spain engaged in wars with both England and France and these affairs effectively cut off access to Spain from elsewhere in Europe. The Reformation initiated by Martin Luther around 1520, certainly would have had an effect, being deeply critical as he was of the practice of indulgences, a concept thoroughly intertwined with the pilgrimage to Santiago. Two centuries later, the Age of Enlightenment certainly did not encourage its rejuvenation. But throughout all of this, the pilgrimage to Santiago never quite died out. 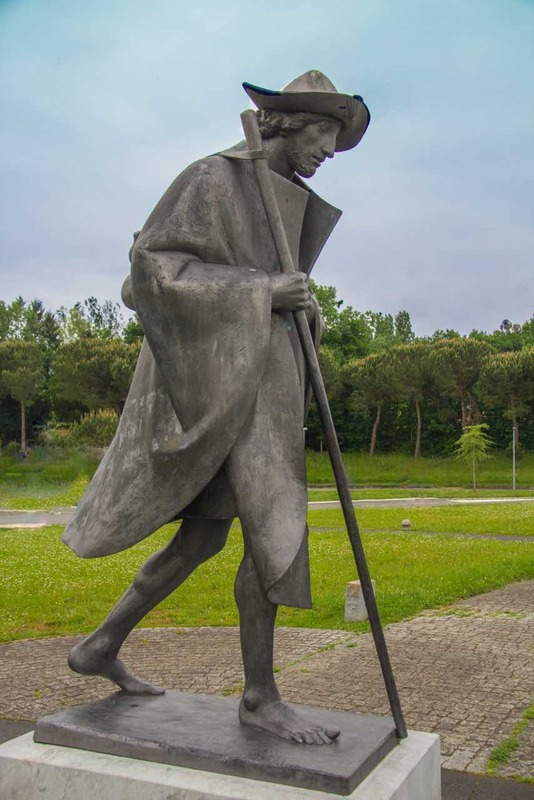 One small piece of evidence to its continuation comes from the journals of John Adams who, while making a land crossing from the Galician coast to Paris in December 1779, wrote that he "…always regretted that we could not find time to make a Pilgrimage to Santiago de Compostela." All of which, brings us to the modern Camino. The reconstruction of ‘The Camino’ as we know it today only began in the late 1970s and 1980s. Don Elias Valina Sampedro from the ‘O Cebreiro’ parish, a dedicated priest and scholar, devoted over 30 years of his life to the restoration of the Camino as a pilgrimage trail. In 1967 he wrote his doctoral thesis on ‘The Road of St James: A Historical and Legal Study’. In conjunction hard working volunteers, the formation of Camino interest groups, and with a few tins of yellow paint, the modern revival of the Pilgrimage to Santiago was set in motion. Perhaps principal amongst the volunteers were Linda Davidson and David Gitlitz, who walked to Santiago five times between 1974 and 1996 whilst accompanying groups of college student-pilgrims on academic medieval study programmes. On their first trek in 1974 they did not meet a single pilgrim. In 1979 the only other pilgrim they encountered was an elderly Frenchman who was fulfilling a vow made in the Second World War. In their book The Pilgrimages Road to Santiago, they wrote ‘To most people in the 1970s the pilgrimage road was hardly more than a vague memory of a historical relic’. In 1982 certification of a pilgrim’s journey was reintroduced and in the same year, Don Elias published his guide for walking the Camino trails to Santiago. In total 1868 pilgrims received the Compostela that year, but this was mainly due to the visit of Pope John Paul II. 1985 was a pivotal year for ‘The Camino’ pilgrimage trail, when at a gathering in Santiago, Don Elias was entrusted with the co-ordination of all the resources for the Camino. ‘Refugios’ were established and he was the first to mark the way with yellow arrows, begging for yellow paint from the departments of roads. Also in that year, UNESCO declared the city of Santiago de Compostela a World Heritage Site. In 1987, the El Camino de Santiago de Compostela pilgrimage trail was named the first European Cultural Itinerary and in 1989, Pope John Paul II visited Santiago again (and sadly, Don Elias passed away). In this year, 5 760 Compostelas were issued, the rise being attributed to the Pope's visit. In 1993, the Camino Frances was named a World Heritage Site. From then on there was an exponential growth in the number of pilgrims walking and riding to Santiago, and those earning the Compostela certificate – a jump from 5 760 in the 1989 Holy Year to 88 436 in the 1993 Holy Year. (The Pilgrim’s Office estimates that only one in five pilgrims walking the Camino actually walk to Santiago and request the Compostela.) In November 2010, the film “The Way” starring Martin Sheen was released, which seems to have been the catalyst for many Americans, Australians, and Kiwis deciding to walk the Camino. It has probably caused other nationalities to also complete the pilgrimage! Some aspects of the modern Camino are fundamentally the same as they were for the medieval pilgrim. As a practical affair, the Camino is a long walk and thus the pilgrim needs support for food, lodging and direction. As was mentioned above, an infrastructure of hospices arose in the Middle Ages and this infrastructure still exists - and in fact, it is growing rapidly. There are still a few pilgrim facilities run by religious orders, but much more common today are albergues or refugios. These are essentially operated like and look like youth hostels typically with bunk beds in dormitories and communal shower and toilet facilities. Some provide breakfast and/or dinner, some have cooking facilities available while some do not, some have a set price while some are donation, some are operated by municipalities or associations, while some are private businesses. Aside from the few albergues that provide meals, refreshments can be found basically in the same sort of places that a tourist would use - restaurants, bars and the like. The medieval pilgrim was undertaking the arduous journey that was the Camino for serious religious reasons. The modern pilgrims' reasons for walking surely span the range from the religious through spiritual to historical and cultural to sport. Where the medieval pilgrim was seeking forgiveness for sins or for theSaint's assistance in some matter, most modern pilgrims will, for whatever reason, be seeking to earn the Compostela or certificate of completion of the Camino from the cathedral in Santiago. To accomplish this, today’s pilgrim carries a pilgrim's credential or passport, which is stamped in the various cities and villages, passed through. This record serves as proof that the route has indeed been walked or bicycled. Probably the most obvious and serious difference between the medieval and the modern pilgrim is that pilgrimage for the former began on his or her doorstep, wherever that might have been, and upon reaching Santiago, the pilgrimage was half over. Today a few walk from home and a few walk in reverse, but this is unusual. Most modern pilgrims walk from St. Jean Pied de Port or just the last 100kms from Sarria, sufficient to obtain their Compostela.